Models that are based on rare images and original vehicles; this is the true joy of our hobby when you are tired of “another Panther/T-34/Sherman/StuG/you name it”. Most likely you have to scratch build, kit bash or wait until a rare vehicle is released in plastic. Not that that would necessarily ever happen, and you might end up investing in resin conversions but these usually increase the cost of the model. Ding-Hao, the new brand from Hobby Fan/AFV club are here to propose something new in the form of a combination of already existing sprues with new resin and etched parts that would make the original vehicle. 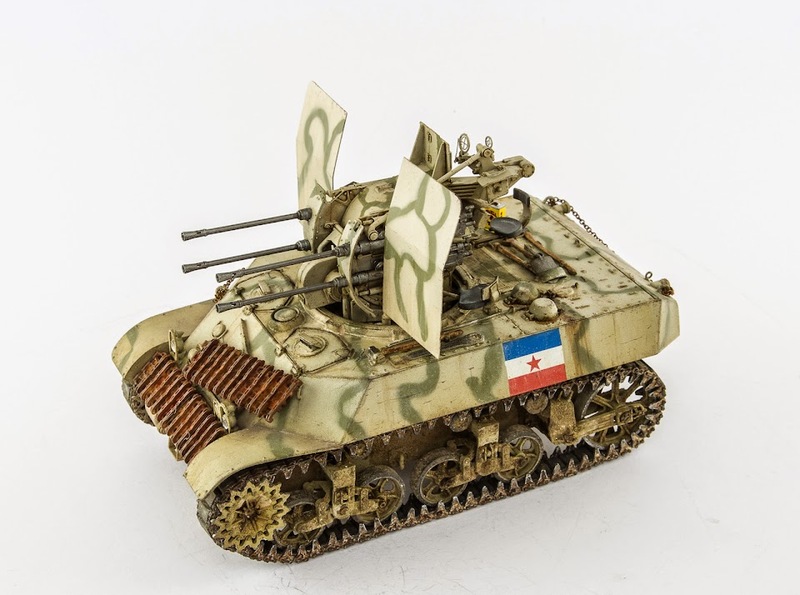 The first 2 releases utilize the venerable M3A3 kit and represent a Yugoslav field conversion. The M3A3 with 2cm Flakvierlieng 38 was a conversion made in 1944 as a rapid fulfilment of the need for a mobile anti-aircraft vehicle (Flakvierling was good against ground unarmored targets too). Altogether 4 tanks were converted and 3 of them were still in use some years after the war. The kit comes in a large cardboard box with many of the rare vehicles drawn on it (future releases?). The box art itself represents the colour images of a completed model by Steven Chen, printed on the glossy photo paper with original WW2 image in the background. I have to admit I really like this way of presenting the model as we see what we actually can get from the box content. Additionally, one could use it as paint reference, as completed model is shown from different angles sufficient to see the original camouflage pattern and great weathering effects that Steven depicted. Inside the box are 10 styrene sprues in individual plastic bags (green for tank and tan for Flakvierling), 3 PE frets, 4 turned metal barrels with separate flash suppressors, 6 casting blocks with resin parts, polycaps for wheels and a pair of vinyl tracks and a decal set. The quality of plastic and resin parts is excellent with no visible flash present, only small molding seams. The suspension has very detailed boogies and all elements can be done workable in case the tracks would be changed to workable plastic tracks (available separately). Here care should be taken when joining the idler wheel boogies; I recommend first dry fitting parts as I recall some problems with it when I was assembling my Stuart 4 years ago. The detail on vinyl tracks is quite reasonable, but I don’t think that they can be used for realistic representation of metal tracks with track pads. The upper hull has nice surface detail with all bolts and welds; however one can detail it a bit more by replacing small tie down brackets with wire or PE, tool holders, adding turned metal barrels with separate cooling jackets and changing the headlights to something with better lens imitation. As with all Stuart kits from AFV club the hull has some internal detail like bolts and firewalls, although no interior is provided. The driver and radioman hatches are workable and can be positioned open. The Flakvierling 38 is one of the most complete versions of this weapon in 1/35th scale and impresses with its quality of molding and sharp detail. Resin parts replace the sides of the base platform of the gun where the extra ammunition was attached on the original unmodified Flakvierling. Therefore we have a new system for loaders seats and shields. Although it is unclear where the ammunition was stored on that field modified tank (in boxes on the rear deck?). The barrels provided are turned metal ones with separate flash suppressors. These have raised barrel changing grips which are an incorrect detail. Otherwise the flash suppressors look accurate and the barrels are the correct length. Furthermore, the kit includes correct sight - Schwebekreisvisier 30/38 made of numerous plastic and PE parts. Finally, the shields are also replaced as these were different from original German design. The PE parts here give accurate scale thickness. One should note that the installation of the floor pan inside the hull that serves as a base for Flakvierling (part R1) is not shown in the appropriate area of the instruction and it must be installed before the joining of the upper hull. The decals include large Yugoslav flags and small red stars, however only the flags are required for this model. Finally, there is one paint scheme provided in the manual which is the same as box art. This kit will give you an exclusive and interesting model. Let’s hope AFV club/Hobby Fan will continue the line of Ding-Hao products and we will see many other original vehicles. Highs: Original subject, great quality of parts. Lows: Vinyl tracks, error in the instructions. I recall seeing one of these on TV back in the 90s. Neat model! This looks like a fantastic little kit, looks like a kit that you can have some fun with for a change, I'm gonna be hunting one of these down. Jeff, I have that one as well. Nice kit. Matt, yeah, this is a fun model. I primed mine yesterday. LINK She is looking very nice indeed with the primer on, and those 4 lion gun barrels look simply stunning to be honest, that's why the kit caught my eye, it's perfect for some fun with the AM goodies.